The future of online data security and privacy is uncertain. With recent data breaches, software vulnerabilities, and hacking attempts, user data is exposed more than ever. People can only hope that the safety and security of their data will be of the utmost importance in the future. It’s a common online practice today for companies to collect data about their customers and website visitors. However, the methods of obtaining this data have veered off-course. They’re collecting it without clearly disclosing what information they’re gathering about people and sometimes, without their permission. These companies often disclose the data they are collecting in a way that people either don’t see or overlook in a long statement. Every day now you hear about a company who has suffered a data breach or was targeted by hackers. According to the Identity Theft Resource Center, 1,579 data breaches occurred in 2017, which was a 44.7% increase from 2016. And it’s not just companies that are being targeted, but consumers as well. Sometimes it’s easier for online criminals to steal information from individuals than large companies. However, both companies and individual users need to do their part in protecting their data from hackers. 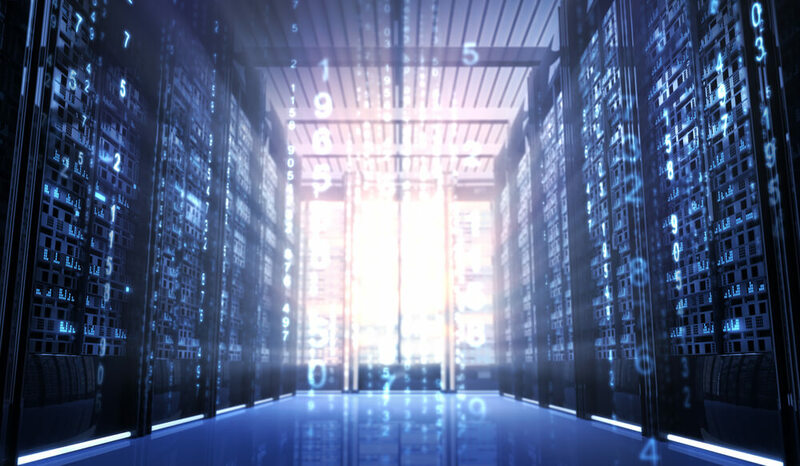 Based on all of the recent data security incidents, people cannot rely on companies and services to keep their data secure. Users need to take their own measures to ensure their online information is safe. Having strong, impenetrable passwords that are different for ALL online accounts. Not sharing login information with anyone. Being aware of what they’re agreeing to on apps. Using phone spy software to monitor their own cell phone activities. Backing up their data on a daily basis. Thought Facebook was secure? Well, think again! It was recently revealed that back in 2015, Cambridge Analytica stole and used the data of 87 million Facebook users. They obtained this information from Aleksandr Kogan, who had collected user data from a personality quiz app he created. At the time, Cambridge Analytica claimed that they deleted the data and did not use it. Facebook has sent its users notifications as to whether or not their information was taken by Cambridge Analytica. Also, on April 10th and 11th, Mark Zuckerberg spoke in front of the U.S. Senate and Congress regarding Facebook’s data policies, Cambridge Analytica, and Russian election interference. Watch the video below for highlights of Zuckerberg’s U.S. Senate hearing. A coalition of 23 groups recently filed a complaint against Google, claiming that it collects the personal data of children under the age of 13 without parental consent. If this is true, it would violate child protection laws pertaining to the collection of data and advertising towards children. According to the coalition, 80% of children ages 6 to 12 years old use YouTube. The main concern is that YouTube’s terms of service says that the site is for children 13 years old and above, but they have actively been promoting the platform towards younger users. On March 25th, 2018, it was discovered by Under Armour that there was unauthorized data access which exposed 150 million MyFitnessPal accounts. If you don’t know what MyFitnessPal is, it’s a fitness tracking app that has been around since 2005. Right now, it is unclear how this incident occurred. Emails were sent to all compromised users, like the one shown below. 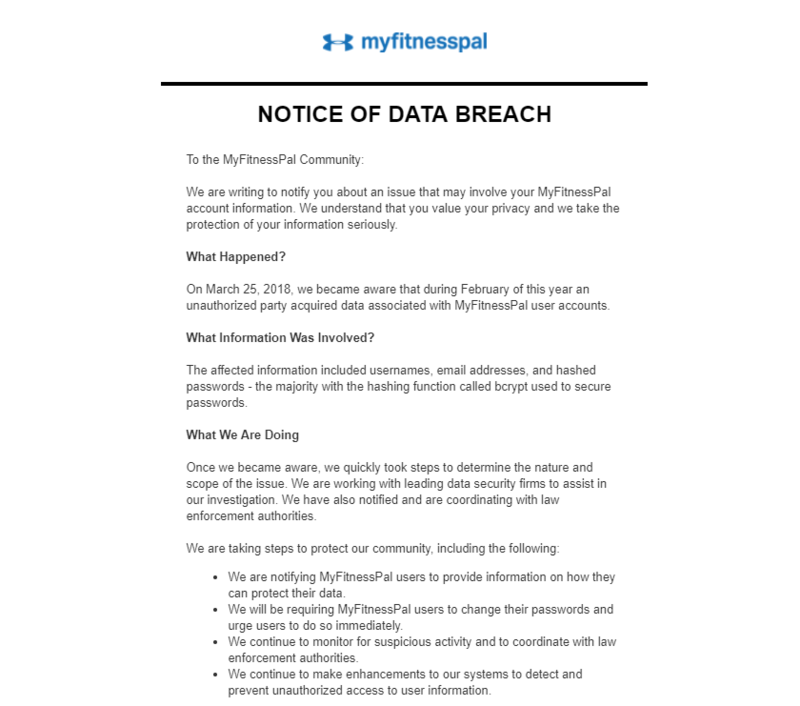 Screenshot of MyFitnessPal email regarding their data breach. Last year, WeChat was accused of collecting and storing data from its users’ chat histories. Of course, these claims were immediately denied. However, if you look deeper, you can find evidence that it is possible for WeChat to spy on its users. So, what this means is that WeChat does track its users’ activities and store their data. What Will The Future of Online Data Security and Privacy Look Like? It isn’t set in stone what the future of data security and privacy will look like. However, based on the present, here are some predictions. Eventually, companies, websites, and apps will be required to disclose what data they collect about their users. No longer would they be able to collect information without user permission. There are companies that are starting to do this, the majority of them haven’t implemented it yet. For example, the recent iOS, macOS, and tvOS system updates include information pages which detail how people’s data is collected and used by Apple. The company’s new focus is being transparent about the privacy of user data. As said before, companies today are sneakily collecting users’ data without permission. This is a huge issue, especially with the recent Cambridge Analytica scandal. Ideally, these companies will not be allowed to do this in the future. Permission and disclosure will be required when collecting user data. People own the information they put online and with that, they have the right to decide if they will grant permission for others to use it. Even though data privacy may become a priority in the future, it could also no longer exist. We are already seeing a lack of online data privacy today. Websites are asking for your name and email, companies are collecting customer information, and social media is tracking your location history. User information is no longer sacred. If action is not taken by companies or the government, online privacy will cease to exist. Right now, the U.S. government does not heavily regulate company data security and privacy. However, they are starting to realize that this issue should be a priority. The future of government regulation of data is already here with the EU’s General Data Protection Regulation (GDPR) law. This law states that companies have to follow strict rules on how data is obtained, stored, and used. It shouldn’t be too long until the rest of the world starts regulating company data collection and passing laws like this. Clearly, data security and privacy will be a hot topic for many years to come. As users, all we can do is be aware of what information we share online and the permissions we grant.